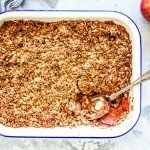 A healthy apple crumble that is so delicious, no one will notice the sugar is missing. It really is that good. Cut the apples in half (no need to peel them) then thinly slice the apples, laying the slices in a baking dish as you go (I used a round 23cm, 1.4 litre dish) . Add the lemon juice, rice malt syrup, cinnamon and nutmeg directly to the dish, and stir until the apples are coated. Whisk together the flour, water and salt, and pour over the apple mixture. Give everything another big stir. In a bowl mix the rolled oats, almond meal, rice malt syrup, cinnamon, and butter/coconut oil. Sprinkle the topping over the apples. Place in the oven and bake for 40 to 55 minutes, until golden and apples bubbling. If you are not quite sure if it’s cooked stick a knife through the top and make sure the apples are soft. Serve warm with cream, yoghurt or coconut yoghurt. If you’re feeling adventurous mix it up a little. Throw in some berries with the apple…trust me, it’s super yum! In the unlikely event of leftover crumble, freeze it! It freezes really well, I like to have it for brekkie every now and then. If you find that the top is browning too fast, pop some aluminium foil loosely over the top. Just remember to remove it 5 minutes before you take your crumble out of the oven.